Like manna from on high. My banners fill the horizons. Their blue stars flame in my eye. My beard of razor wire. My wrath cannot be measured. My breath is as white fire. To scythe down from the sky. My voice causes the very earth to quake. Why then, does your hand still shake? With thoughts so bleak and so appalling? Why this helpless sense of falling? Reveals your wretched feet of clay? Aaronovich bites the dust big time. The UK envoy to the UN shoots himself in the foot in public. 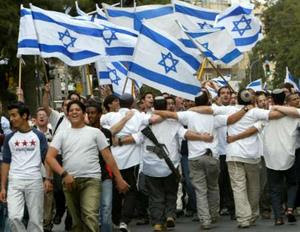 The faithful friends of Israel are not so self assured. I wish I shared your optimism! But one thing is certain... that there are reasons to be cheerful for those in this struggle is itself a victory.